This comment (from a University of Southhampton pre-publication news release) needs some explanation to relate it to IPCC AR5. Through their projections, Dr Goodwin and Professor Williams advise that cumulative carbon emissions needed to remain below 195-205 PgC (from the start of 2017) to deliver a likely chance of meeting the 1.5°C warming target while a 2°C warming target requires emissions to remain below 395-455 PgC. The PgC is peta-grams of Carbon. For small weights, one normally uses grams. For larger weights one uses kilograms. For still larger weights one uses tonnes. Under the Imperial measurement system, one uses ounces, pounds and tons. So one peta-gram is a billion (or giga) tonne. Following the IPCC’s convention, GHG emissions are expressed in units of CO2, not carbon. Other GHGs are expressed in CO2e. So 1 PgC = 3.664 GtCO2e. So the emissions from the start of 2017 are 715-750 GtCO2e for 1.5°C of warming and 1447-1667 GtCO2e for 2°C of warming. To make comparable to IPCC AR5, (specifically to table 6.3 from IPCC AR5 WG3 Chapter 6 p431), one needs to adjust for two things – the IPCC’s projections are from 5 years earlier, and for CO2 emissions only, about 75% of GHG emissions. The IPCC’s projections of CO2 emissions are 630-1180 GtCO2 for 1.5-1.7°C of warming and 960-1550 GtCO2e for 1.7-2.1°C of warming. With GHG emissions roughly 50 GtCO2e a year and CO2 emissions 40 GtCO2 a year, from the IPCC’s figures updated from the start of 2017 and expressed in GtCO2e are 570-1300 GtCO2e for 1.5-1.7°C of warming and 1010-1800 GtCO2e for 1.7-2.1°C of warming. Taking the mid-points of the IPCC’s and the Goodwin-Williams figures, the new projections are saying that at current emissions levels, 1.5°C will be breached four years earlier, and 2°C will be breached one year later. Only the mid-points are 1.6°C and 1.9°C, so it makes no real difference whatsoever. The Goodwin-Williams figures just narrow the ranges and use different units of measure. But there is still a major problem. Consider this mega table 6.3 reproduced, at lower quality, below. Notice Column A is for CO2 equivalent concentration in 2100 (ppm CO2eq). Current CO2 levels are around 405 ppm, but GHG gas levels are around 450 ppm CO2eq. Then notice columns G and H, with a joint heading of Concentration (ppm). Column G is for CO2 levels in 2100 and Column H is for CO2 equivalent levels. Note also that for the first few rows of data, Column H is greater than Column A, implying that sometime this century peak CO2 levels will be higher than at the end of the century, and (subject to the response period of the climate system to changes in greenhouse gas levels) average global temperatures could (subject to the models being correct) exceed the projected 2100 levels. How much though? Using a magic equation at the skeptical science blog, and (after correcting to make a doubling of CO2 convert to exactly 3°C of warming) assume that all changes in CO2 levels instantly translate into average temperature changes. Further, I assume that other greenhouse gases are irrelevant to the warming calculation, and peak CO2 concentrations are calculated from peak GHG, 2100 GHG, and 2100 CO2 concentrations. I derived the following table. The 1.5°C warming scenario is actually 1.5-1.7°C warming in 2100, with a mid-point of 1.6°C. The peak implied temperatures are about 2°C. The 2°C warming scenario is actually 1.7-2.1°C warming in 2100, with a mid-point of 1.9°C. The peak implied temperatures are about 2.3°C, with 2.0°C of warming in 2100 implying about 2.4°C peak temperature rise. So when the IPCC talk about constraining temperature rise, it is about projected temperature rise in 2100, not about stopping global average temperature rise breaching 1.5°C or 2°C barriers. Now consider the following statement from the University of Southhampton pre-publication news release, emphasis mine. Professor Williams, Chair in Ocean Sciences at Liverpool, added: “This study is important by providing a narrower window of how much carbon we may emit before reaching 1.5°C or 2°C warming. There is a real need to take action now in developing and adopting the new technologies to move to a more carbon-efficient or carbon-neutral future as we only have a limited window before reaching these warming targets.” This work is particularly timely given the work this year of the Intergovernmental Panel on Climate Change (IPCC) to develop a Special Report on the Impacts of global warming of 1.5°C above pre-industrial levels. 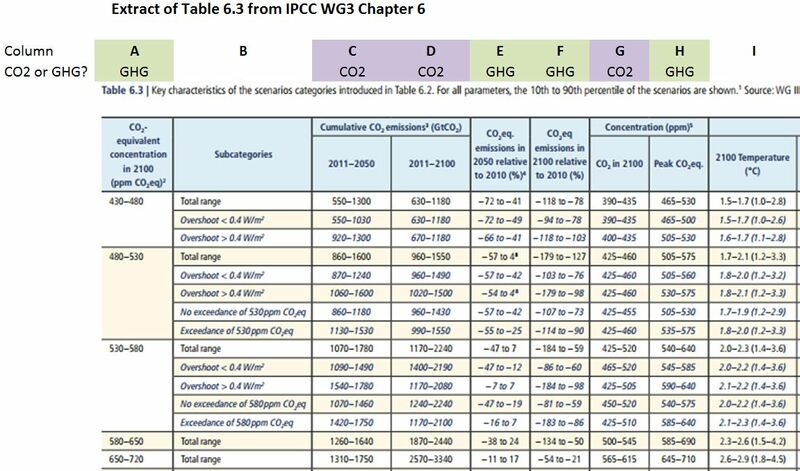 The basic difference between IPCC AR5 Chapter 6 Table 6.3 and the new paper is the misleading message that various emissions policy scenarios will prevent warming breaching either 1.5°C or 2°C of warming when the IPCC scenarios are clear that this is the 2100 warming level. The IPCC scenarios imply that before 2100 warming could peak at respectively around 1.75°C or 2.4°C. My calculations can be validated through assuming (a) a doubling of CO2 gives 3°C of warming, (b) other GHGs are irrelevant, (c) there no significant lag between the rise in CO2 level and rise in global average temperature.